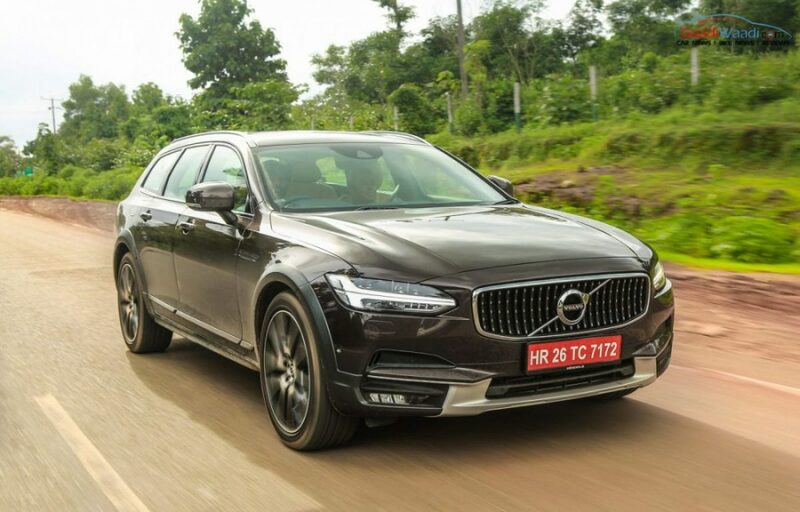 This is exciting news for some car buyers in India as Volvo is launching the all-new V90 Estate in its Cross Country guise. 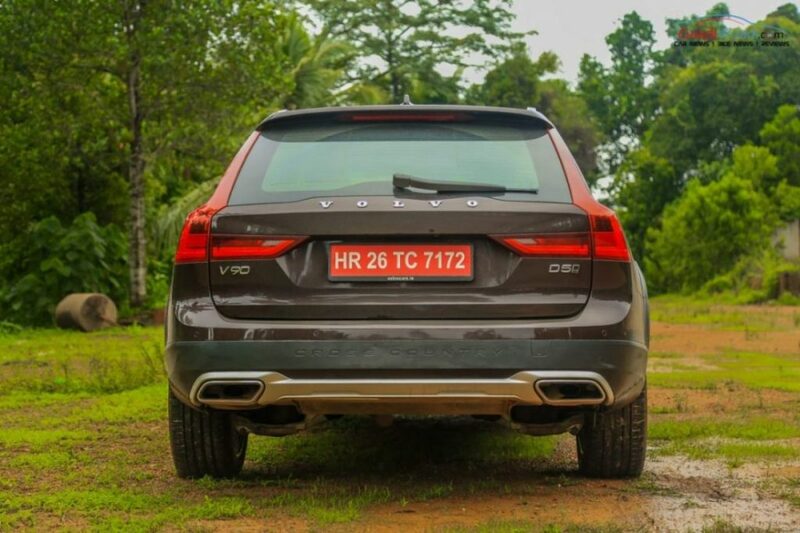 First the new-gen XC90, then the S60 CC, S90 Sedan and the S60 Polestar were the new breed of vehicles Volvo Auto launched in India in a very short span of time. 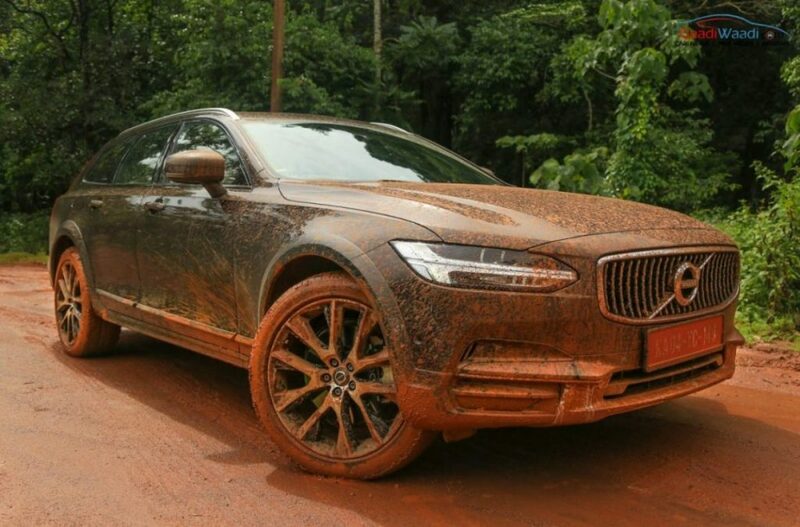 They are to introduce the V90 Cross Country on 12th July and it is incredibly a bold move knowing the fact that all previous attempts from different manufactures in the Station wagon segment have failed. However, the taste of car buyers has changed over time as the demand for practical luxury cars with safety and space is high these days. 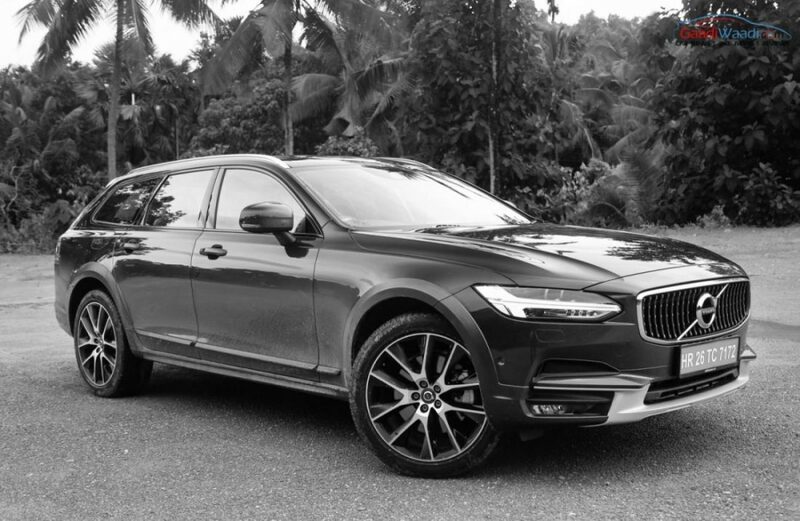 The V90 is doing pretty good for Volvo in international markets and this leads to the introduction of the Cross Country in world’s 4th fastest growing economy. 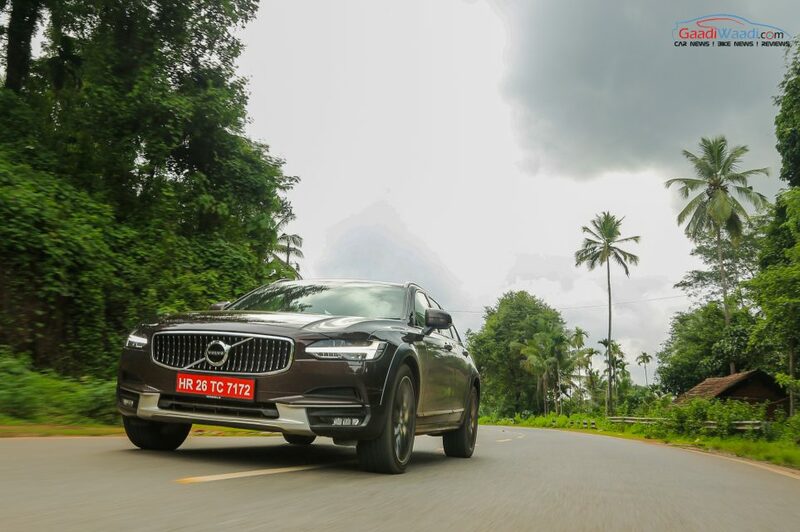 Last week, Volvo Auto invited us to test drive the V90 Cross Country – specially its capability in Scotland of India, Coorg that is famous for Coffee Estates. 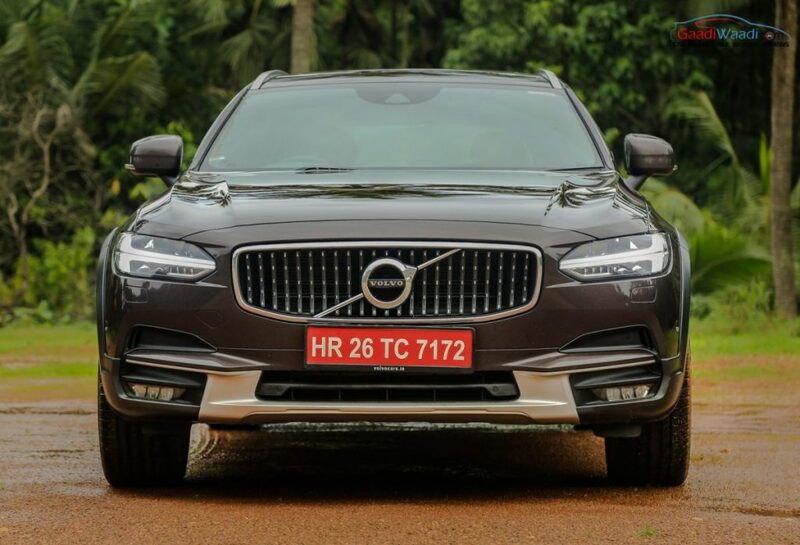 On the outside, the Volvo V90 Cross Country’s front grille features vertically stacked black bars with chrome squares as opposed to the chrome bars on the S90 sedan. The changes are more than meet the eye as the bottom portion of the front bumper much angular and accented in silver. It brings a aggressive and off-roading presence to the big vehicle. 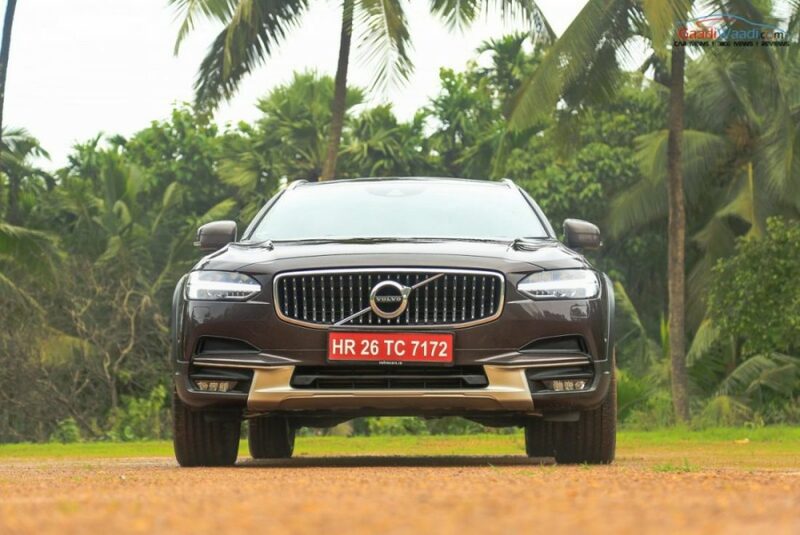 At the sides, the 20-inch alloy wheels look nothing short of impressive and along with the suspension system it gets 58 mm additional ground clearance (at 210 mm) than the S90. The signature station wagon body style is not all that boring as you will get used to it driving along and looking at it more than once. 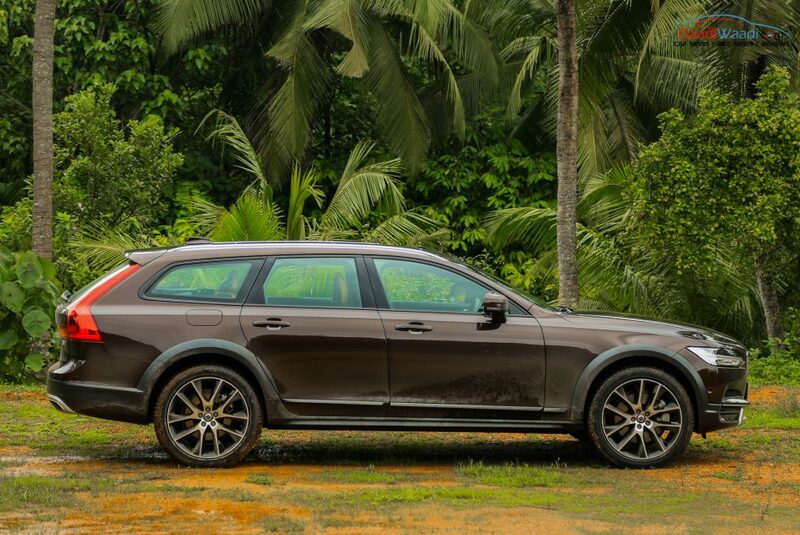 The V90 CC could change the perception that wagons are hideous indeed by a country mile. 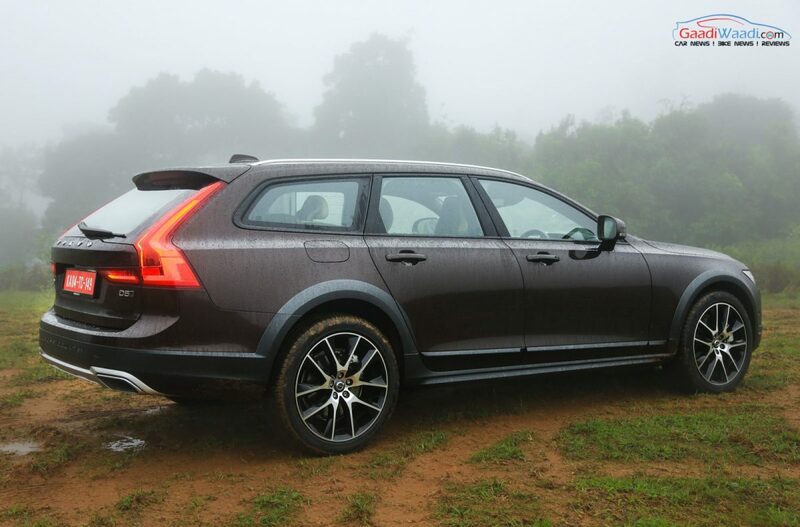 Other than that, the raked windshield, generous ground clearance, well-laid spoiler and the Swedish brand’s signature vertical tail lamps ensure a complete package. We were impressed by its styling and the way everything was put together. Last but not the least, the sleek headlamps with Thor’s Hammer design LED lights double up its road presence looking head on. 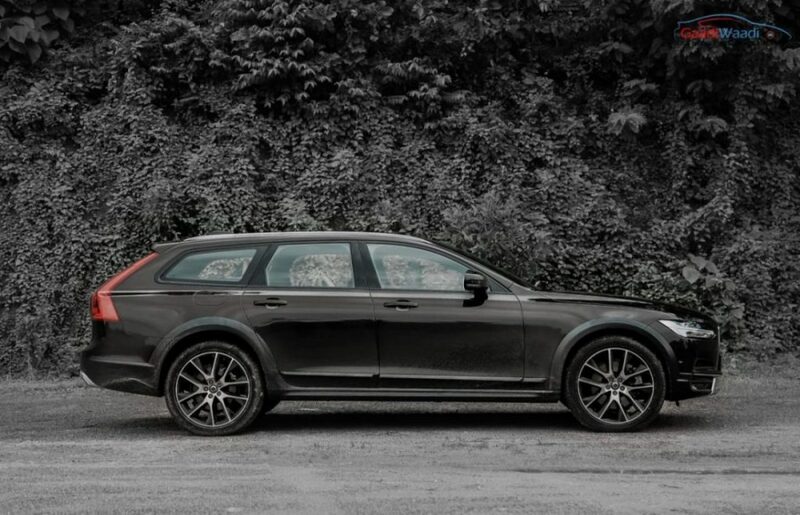 Based on the lightweight Scalable Product Architecture (SPA) platform that underpins the 90 series models, the V90 Cross Country is a versatile take on the V90 Estate due to the presence of four-wheel-drive configuration. 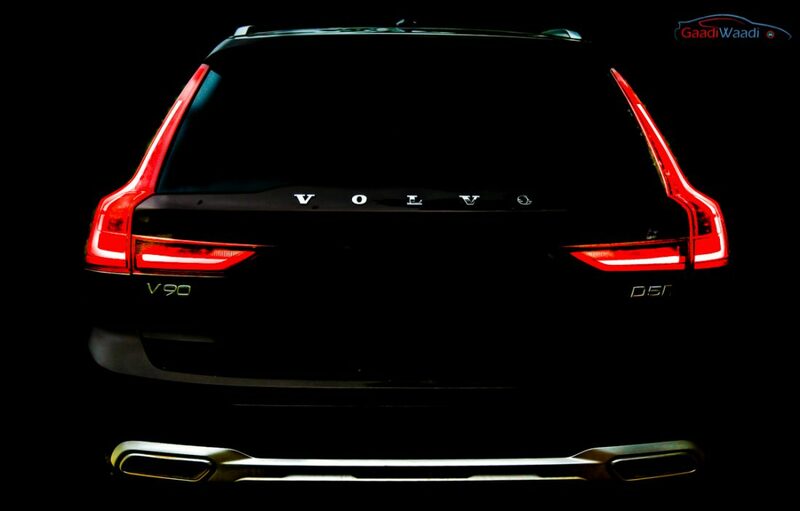 The V90 Cross Country measures a commendable 4,936 mm in length while the 1,879 mm in width is generous enough for passengers and the 1,475 mm height with wheelbase of 2,941 mm make the space factor highly desirable. 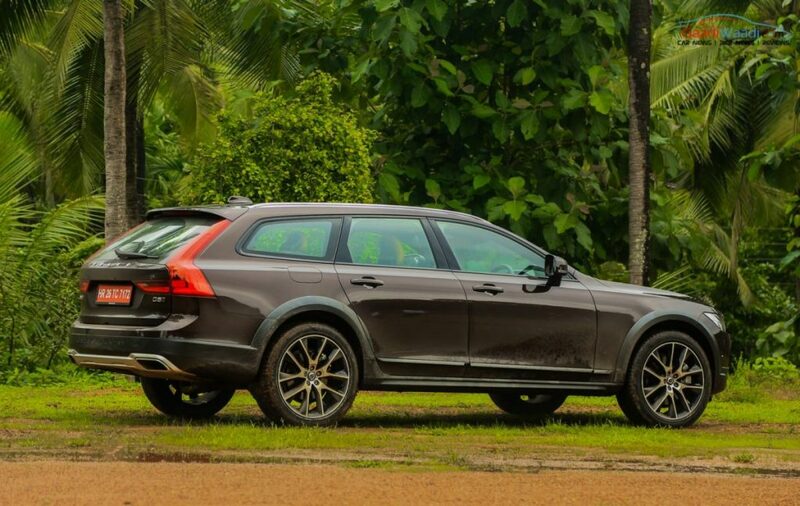 It features 60 litres of additional bootspace due to its wagon style than the S90 (at a total of 560 litres) but pays the penalty in weight as it tips the scale at 2.4 tonnes while having a big turning circle of 11.4 metres. 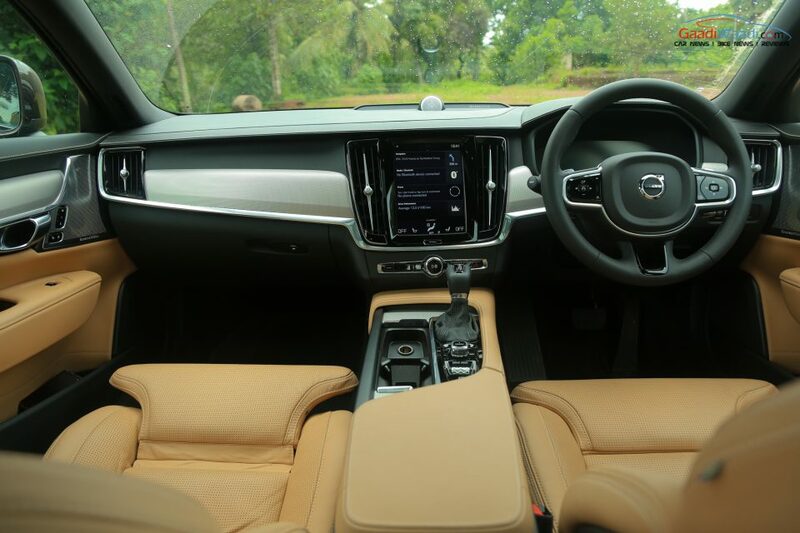 The V90 Cross Country’s interior brings a whole new level of Scandinavian excellence, just like the flagship S90 sedan. However, in contrast to the S90, which has beige leather and walnut combination, the V90 CC is offered in a number of different trims such as amber, maroon brown or charcoal-leather with aluminium mesh trim. In a nutshell, you could not ask for a more premium cabin as everything is well laid out and plush with top-notch soft touch portions, adjustable vertical air conditioning slats, large tablet-sized touchscreen infotainment system and of course the undeniable build quality. 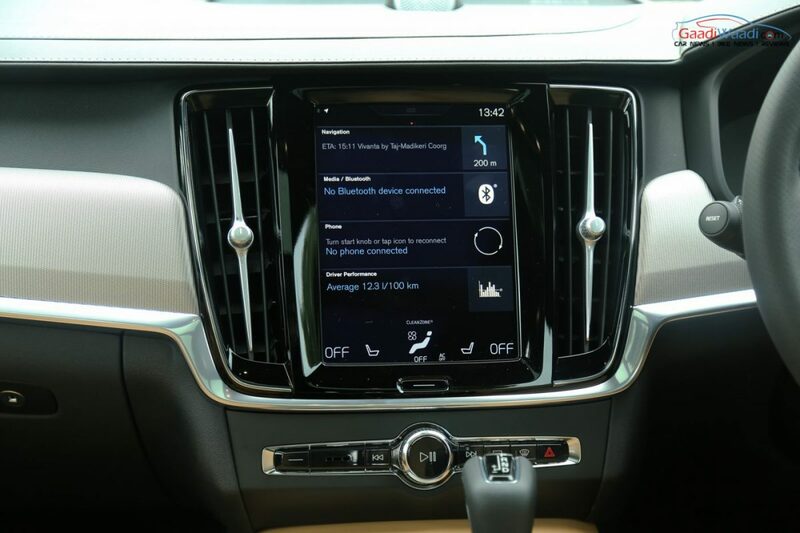 Volvo minimised the number of buttons in the cabin as pretty much all functions are just a touch away. It does not increase the complexity though as you can get used to them very easily. Switching between the air-con controls needs toggling between screen and it can get a bit intriguing. It might distract you while driving. 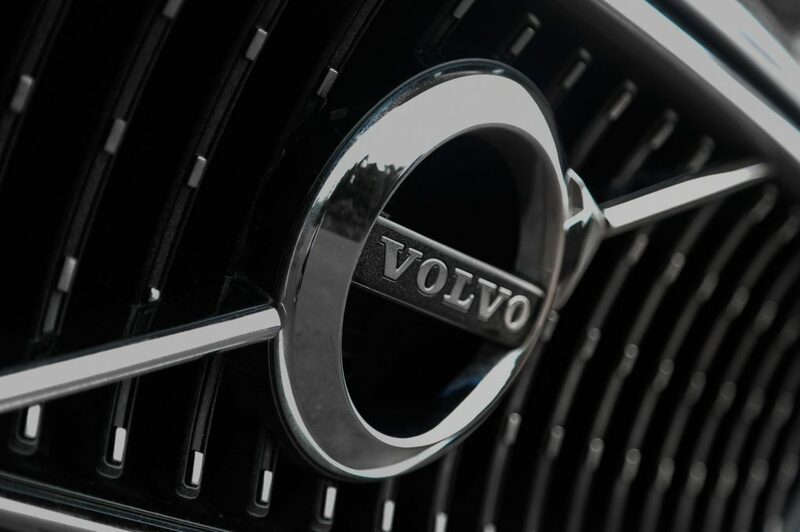 Courtesy of the orthopedic surgeons Volvo had gone on to while designing the seats, they are shaped well with comfortness and cushioning at the highest level and let alone the massage functions to keep you relaxed more. 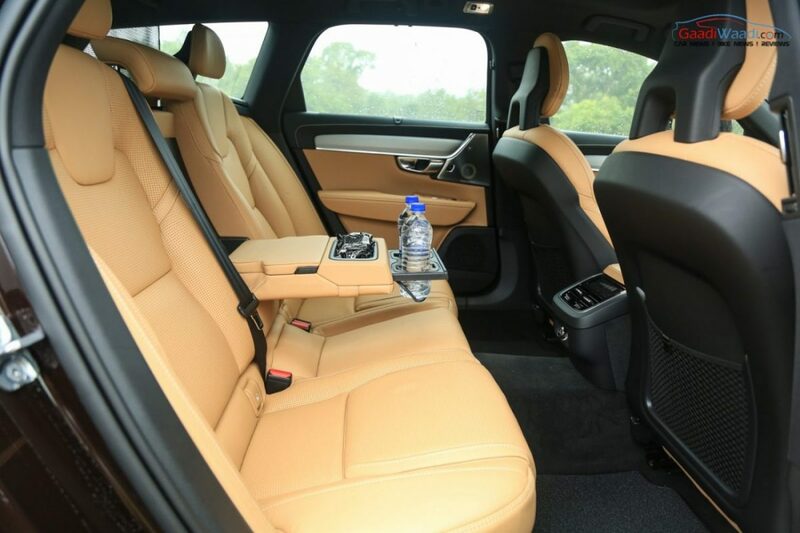 The cooled front seats get electrically adjusted for lateral, thigh and lumbar support and they can be chosen according to individual preference. 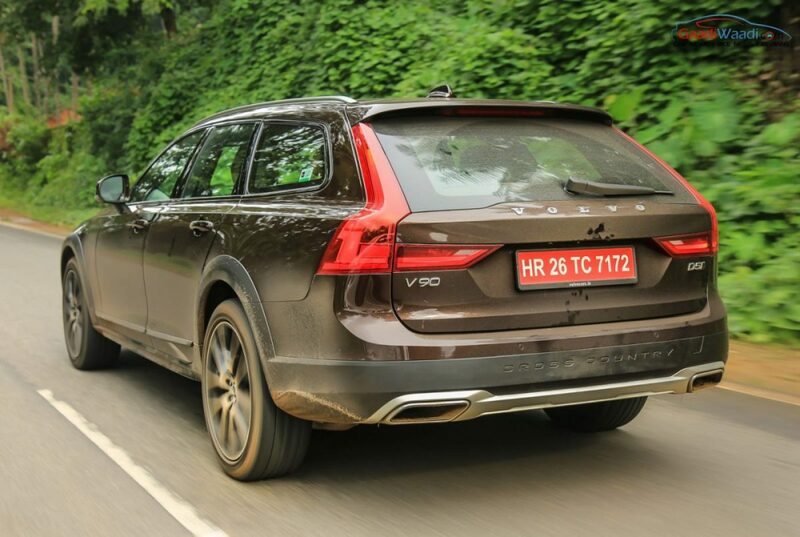 The rear bench seats are equally built well and the wagon body-style offers more headroom than the S90. The panoramic sunroof is a feature occupants will love about on a long journey while there are plenty of other driver assistance and convenience stuff to look out for. 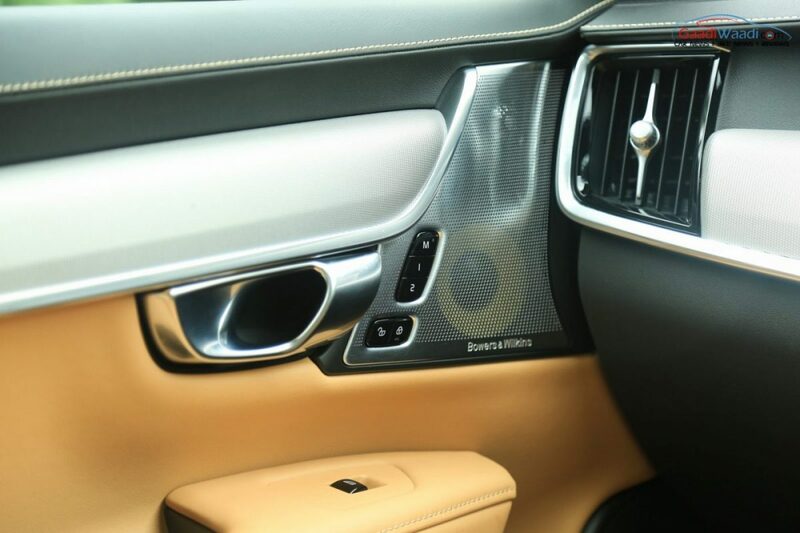 A four-zone climate control, woven aluminium trim with leather choice, electric tailgate, Bowers and Wilkins music system with subwoofer are some of the features Volvo provides with the V90 Cross Country. 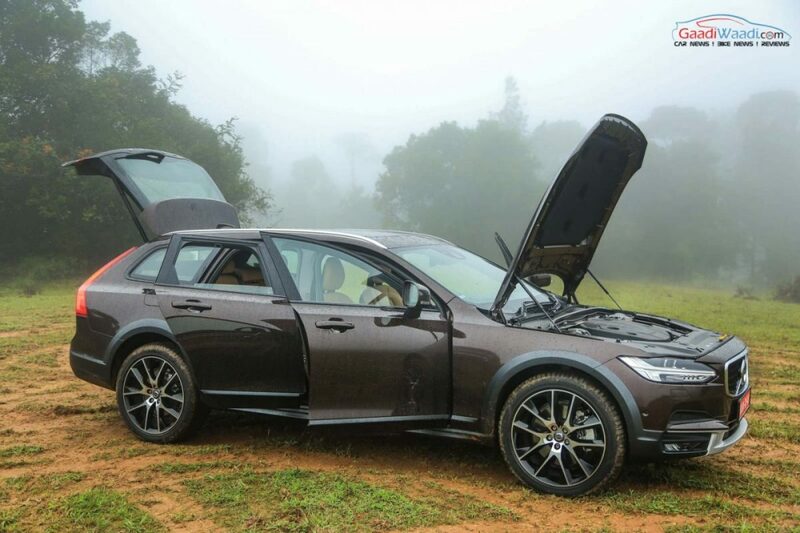 Volvo, being a safety pioneer, has stuffed the V90 Cross Country with several features. In terms of assisting the drivers electronically as well, loads of thought has been put into bringing out the best possible package. As for the convenience, there is a power-operated tailgate and the massage functions on front seats can be dialed in different ways. The Adjustable Steering Force technology helps in operating the steering based on your effort levels while the Park Assist works just as well during the strenuous parking situations we often get entangled in. The eight-inch driver info display is another peach as details can be rear clearly and is easy to get used to. 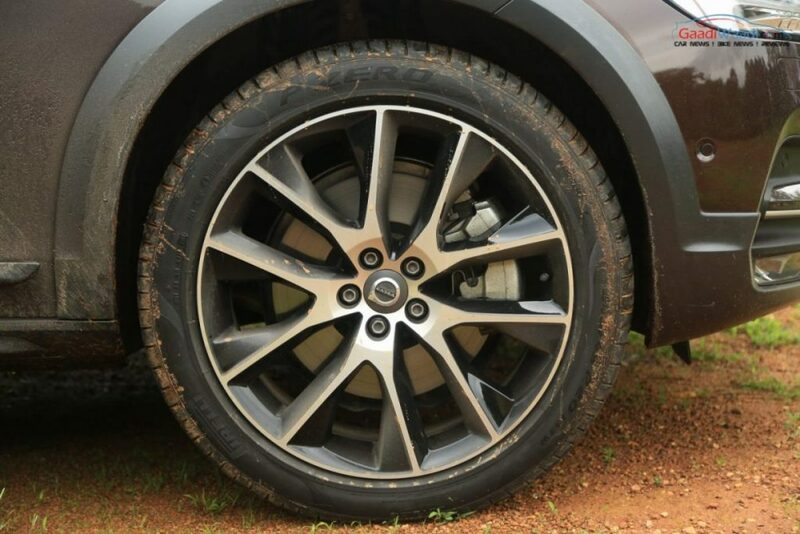 The 20-inch wheels as we mentioned before does effective off-roading but you would get robbed off a little fun as the CC is obviously a station wagon. 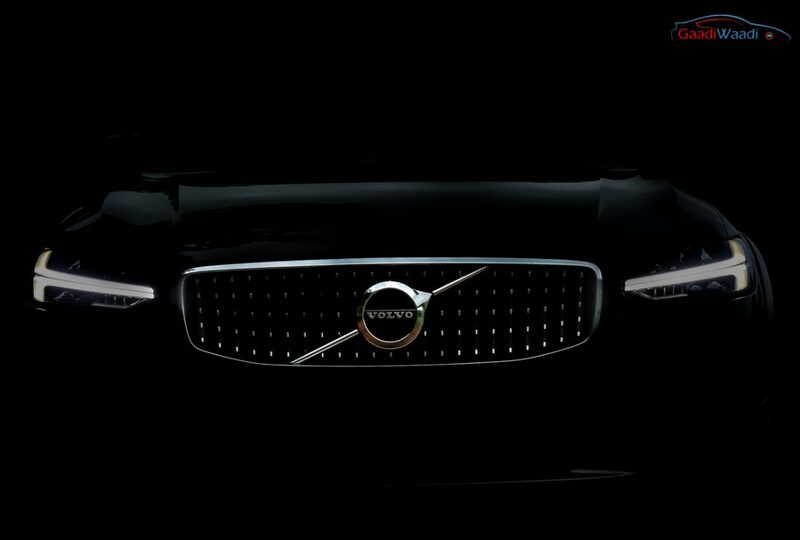 The full LED Thor’s Hammer headlamps carries on the latest design language Volvo has adapted worldwide and having tried it in all situations, we would say it has really good illumination. The heated steering is another factor driver will feel comfortable about. 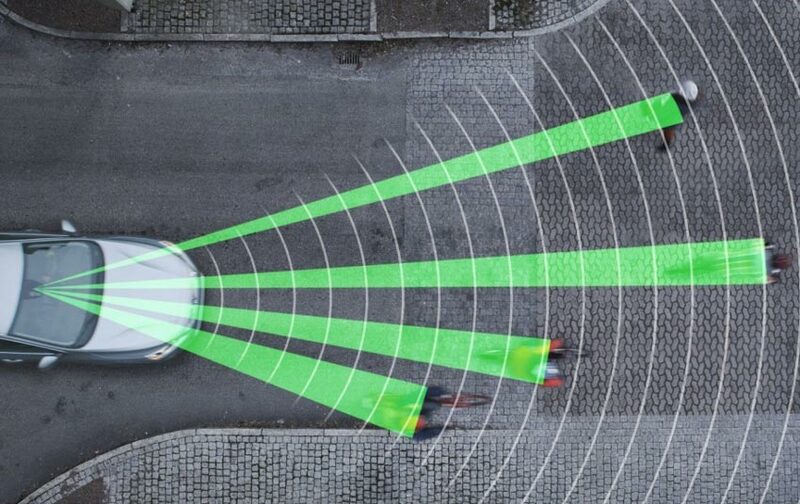 The Swedish company has introduced Radar-assisted safety features on the V90 Cross Country. 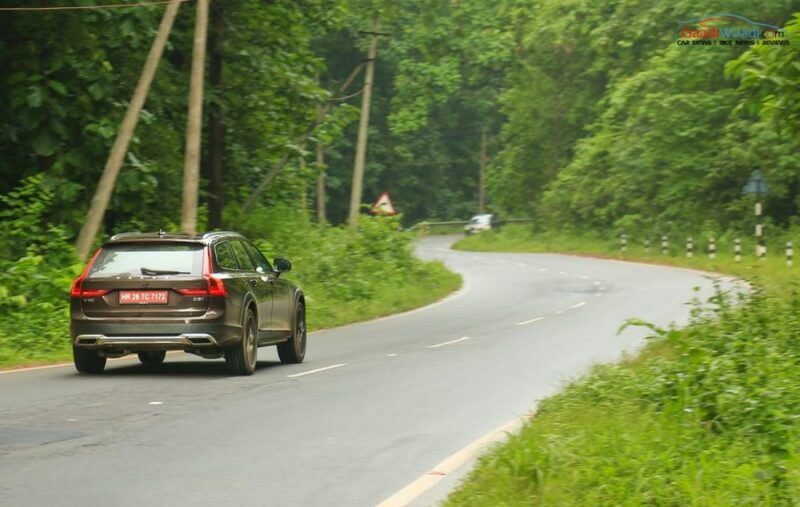 Some are designed to avoid collision keeping the external factors in mind while others are to ensure the V90 CC always on road safely. 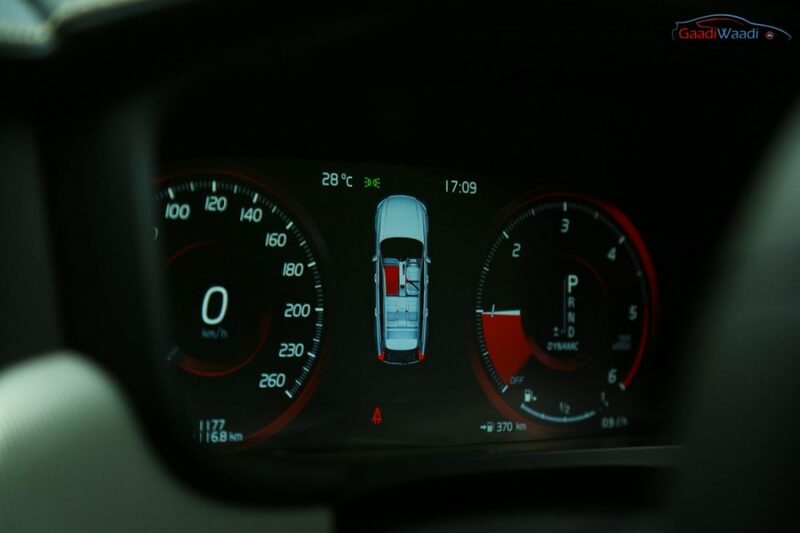 For instance, the spin control avoids the car from spinning around on loose surface while the traction control, lane keep and mitigation systems are immensely useful in daily driving. The important technologies used are adaptive cruise control, Pilot Assist, city safety with steer assist, oncoming lane mitigation, road edge detection, run-off road protection, lane keeping aid, full length inflatable curtains, spin control, engine drag control and corner traction control. Unlike the flagship S90 sedan’s D4 diesel engine, the Volvo V90 Cross country comes equipped only with the XC90’s D5 diesel mill that generates 235 HP and a whopping 485 Torque – making it one of the most powerful small capacity engines out there in India. 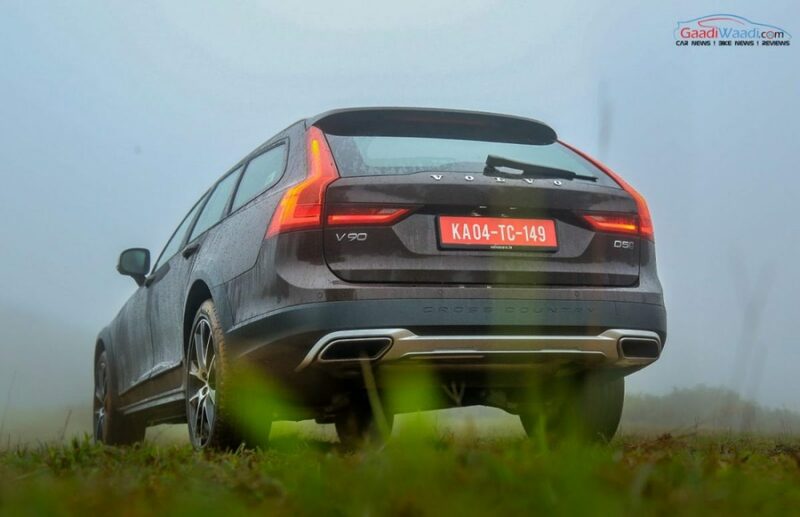 To make this motor turbo lag free, Volvo has put Power Pluse technology that helps in kicking the turbo right from as low as 500 rpm and it aids in providing an instant smooth response throughout. The D5 engine is coupled with an eight-speed automatic transmission that ensures the gear-shifting smoother. However, the downshifts are not that responsive. 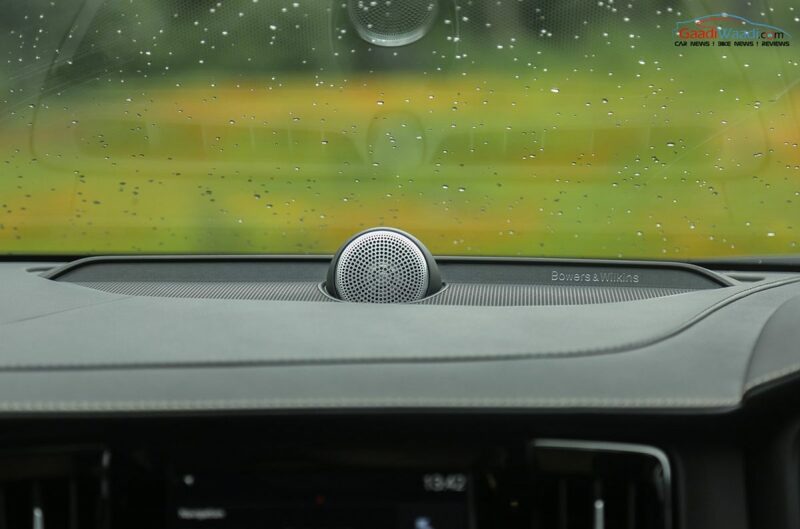 If you want to play hard also, the Sports mode is not available in the car but you can drive the car in manual mode and make the drive sportier by using paddle shifters. It touches the 200 kmph mark very easily and can be go even further. 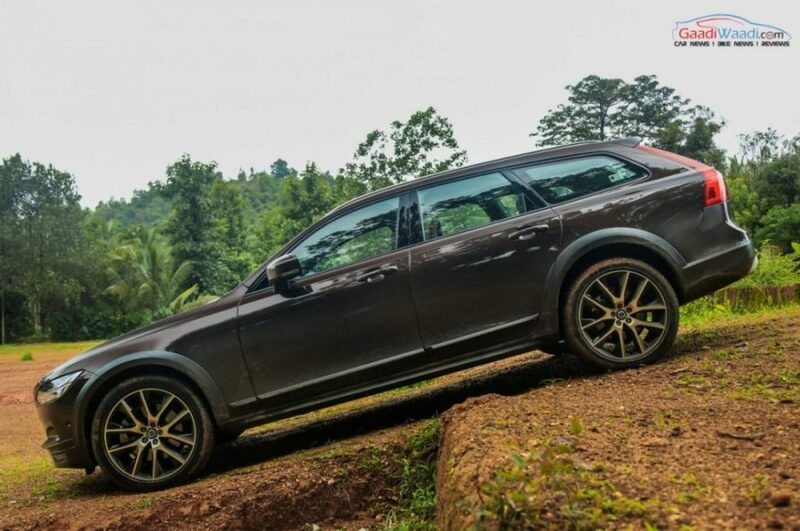 Being a station wagon blessed with off-roading capability and thanks to the Cross Country guise, the V90 CC comes with four driving mode namely Eco, Comfort, Dynamic and Off-road just like the brand’s flagship XC90 SUV. Eco mode suits best in heavy traffic condition and city condition as it softens the engine response and makes steering lighter and delivers more fuel economy than other three modes. Comfort mode makes car little more responsive, however, dynamic modes makes the car’s response sportier and so makes the steering agile. 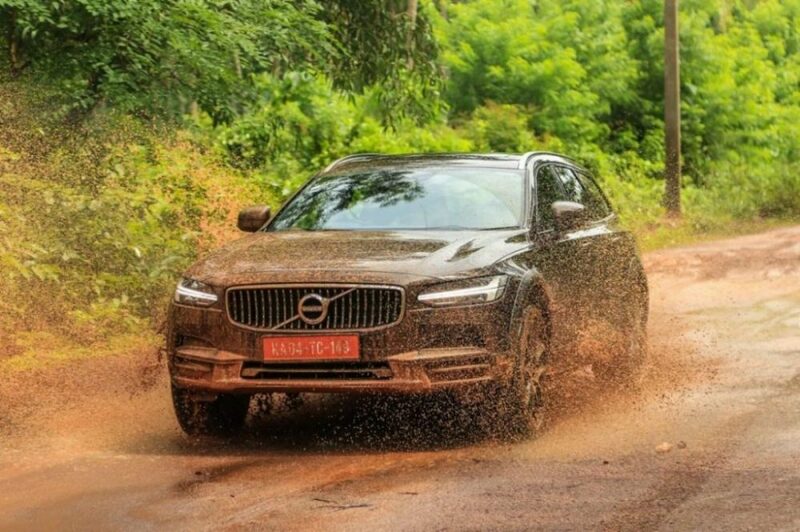 The Off-road mode lets you to drive on some real bad roads and muddy tracks (like we did and these pictures suggest) quite easily as it sends more torque to the rear wheels and engages hill descent control but the mode works upto 40 kmph only. 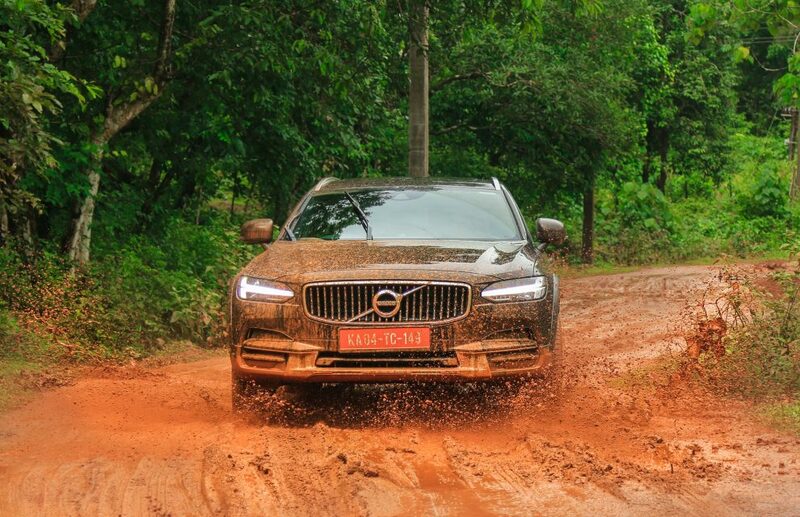 Thanks to the air suspension at the rear and double wishbones up the front, the ride is plush and relaxing at the same time while being able to adapt to different off-roading conditions. 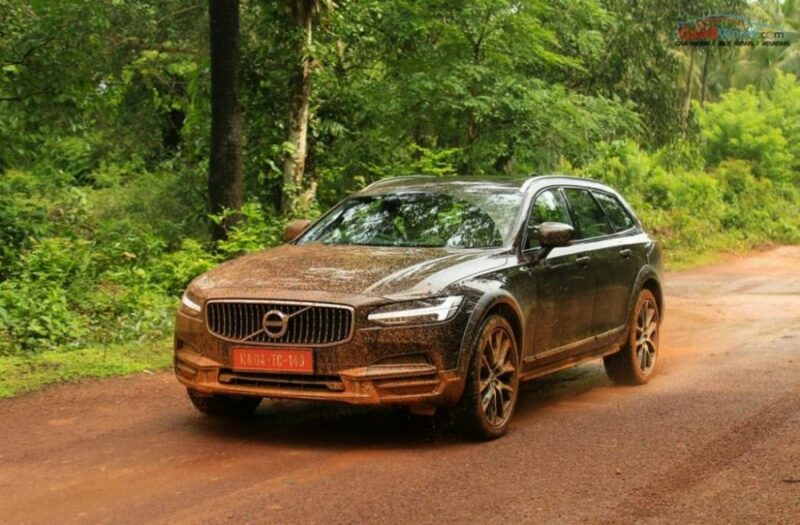 The Dynamic mode makes the suspension more solid while off-road mode increases the ground clearance to 210 mm that is enough to make the ride more comfortable but Pirelli tyres spoils the fun in mud and the Volvo’s AWD won’t let you to stuck so easily. 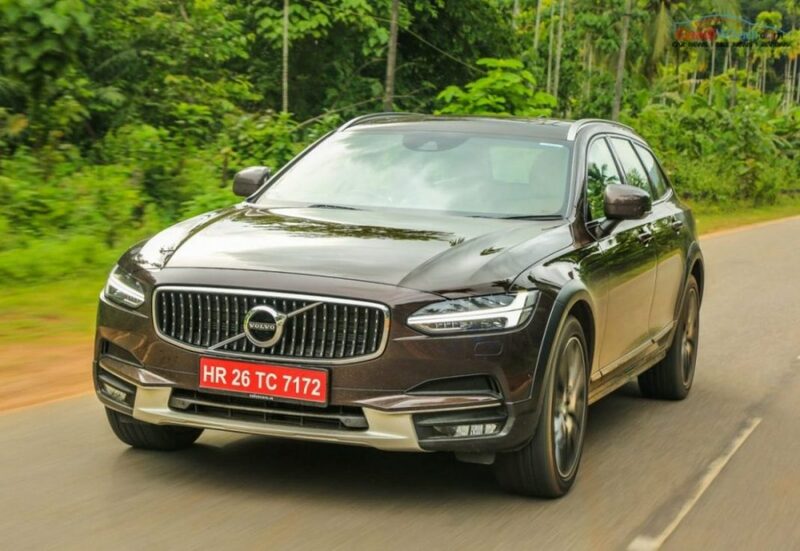 While Volvo’s orthopedic seats make the ride more relaxed however, only four can sit comfortably and adding fifth passenger at the rear can spoil the comfort of other two. The seat massage function on both front seats won’t let you to seat at back for sure. 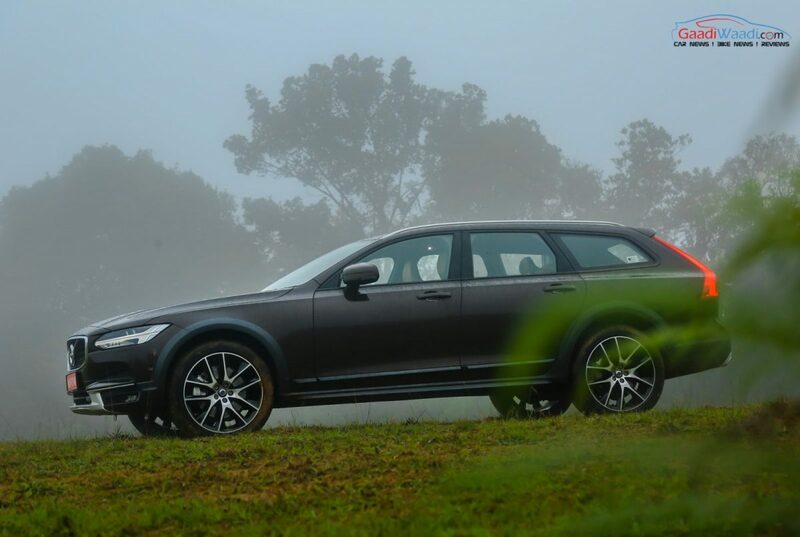 Once on the move, you can find the V90 with D5 motor as one of the most silent diesel motor in segment or a segment above because of the superb cabin insulation that works perfectly even at good speeds. On the highway, V90 offers a confident and relaxed driving experience while fair amount of bodyroll is available due to its proportions. The station wagon body style won’t allow you for zig-zag driving if rear passengers’ comfort is your priority at that point of time. 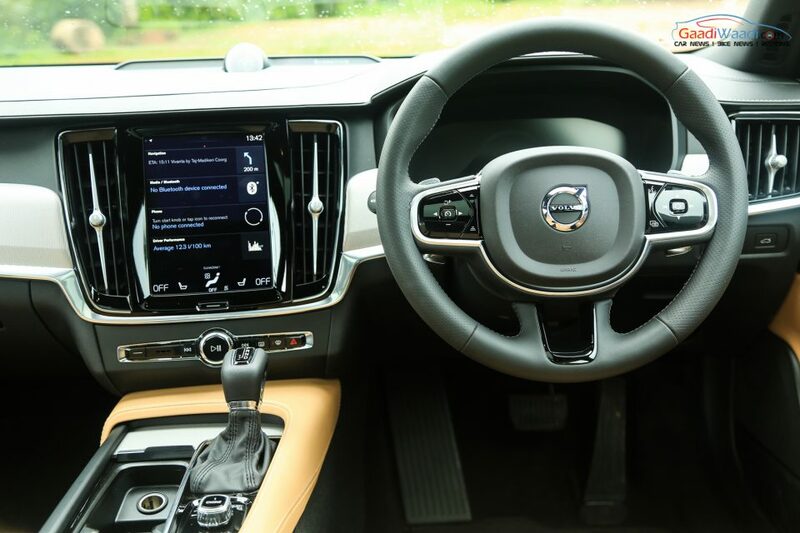 Volvo brings some top notch features like Lane Keeping AID (works only with clear road markings) and the Radar based pilot assist with active cruise control makes your drive more pleasurable and safe. 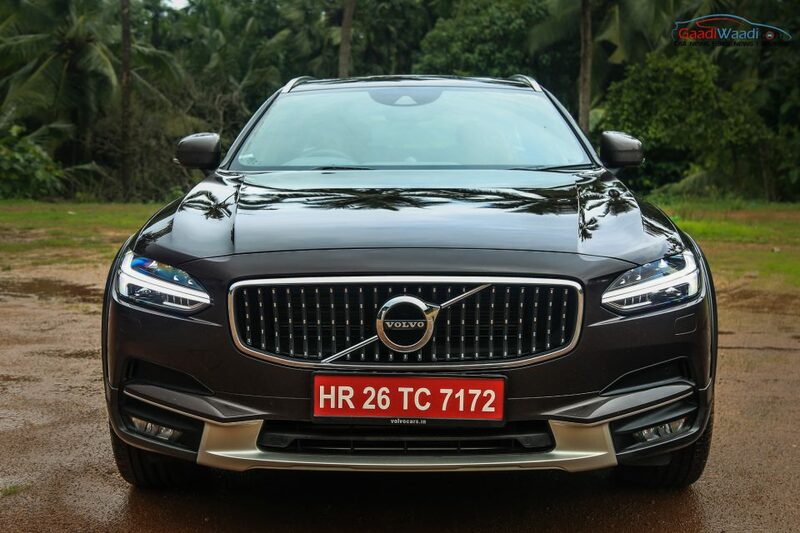 So should you go for the all new V90 CC ? 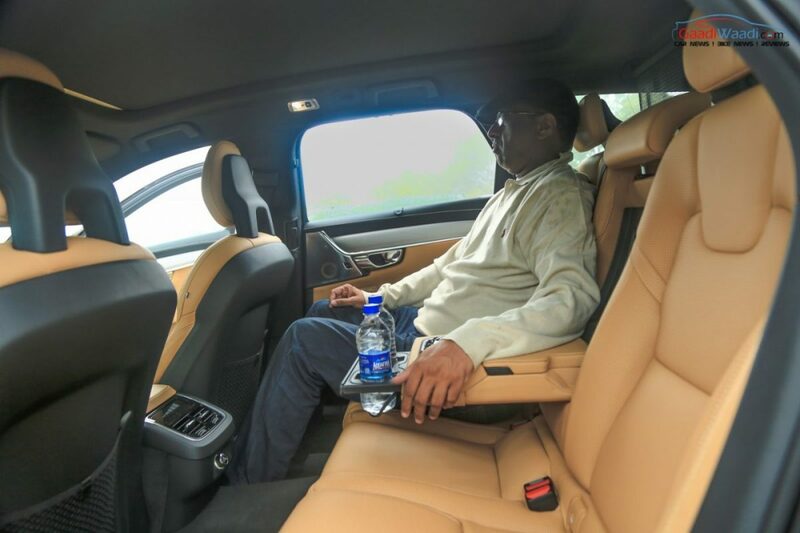 Yes, if safety is your priority, space is your requirement and luxury is your essence then this is right choice and mind you it looks like no other car in India. 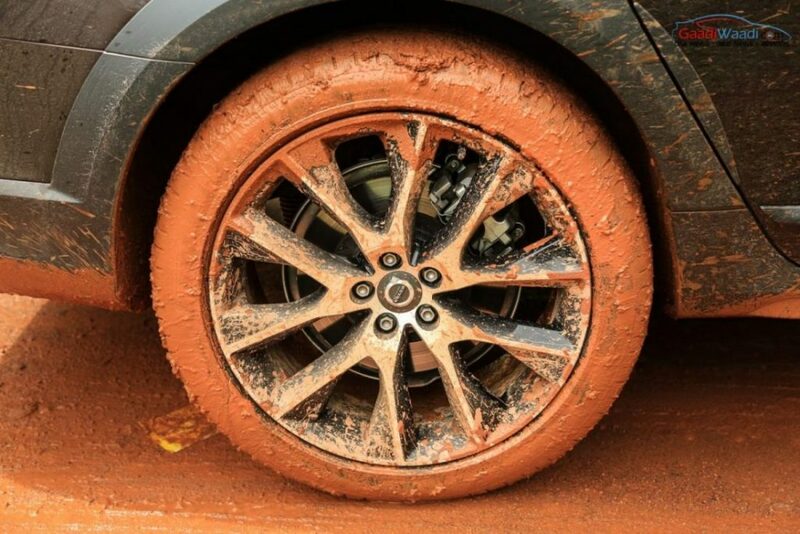 Its offers a car like experience from the cabin with SUV inspired off-roading capability and confidence. 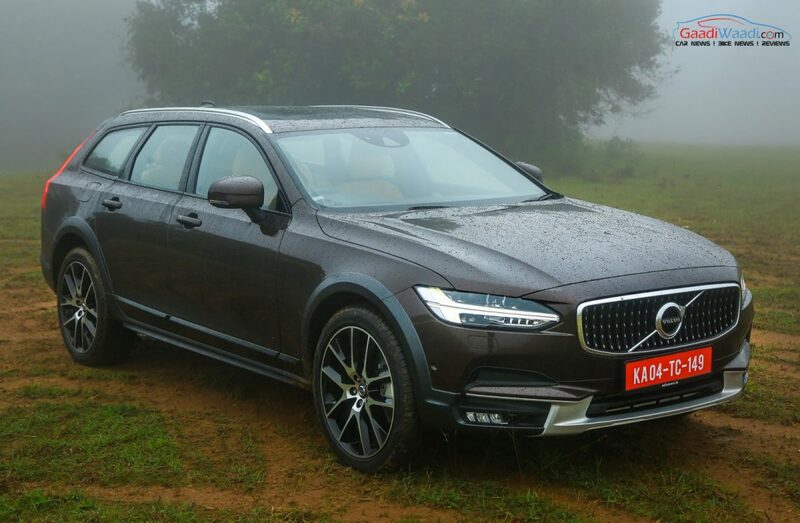 Also, some first-time features considering the price (expected in between S90 Sedan and XC90 SUV i.e around 62-66 Lakh) like Pilot Assist, Lane Keeping Aid, Adaptive Cruise control, 1,400 watt Bowers & Wilkins Music System, Seat Massage Function, panoramic sunroof, 8-speed Automatic Gearbox with Paddle shifters, Air Suspension, 20inch Alloys, Bigger Boot Space, full LED headlamp/tailamp and numerous more are enough to amaze you. 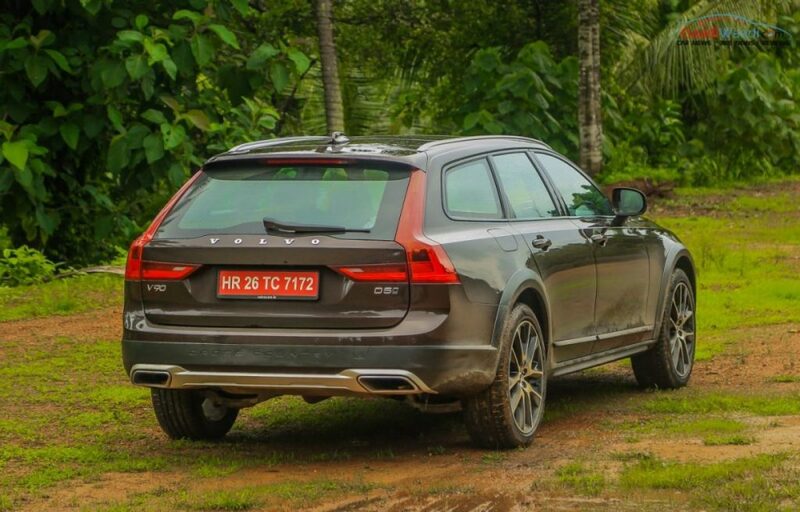 However, there is no direct rival to this car in India but its success could force Audi n Mercedes-Benz to bring A6 all road and E-Class Estate to our market. So, if you are planning to buy a new luxury car and are comfortable with Station Wagon (it should be renamed as Airport Wagon Body Style as it is 2017 not 1990) then it could rightfully prove to be the best option for you.